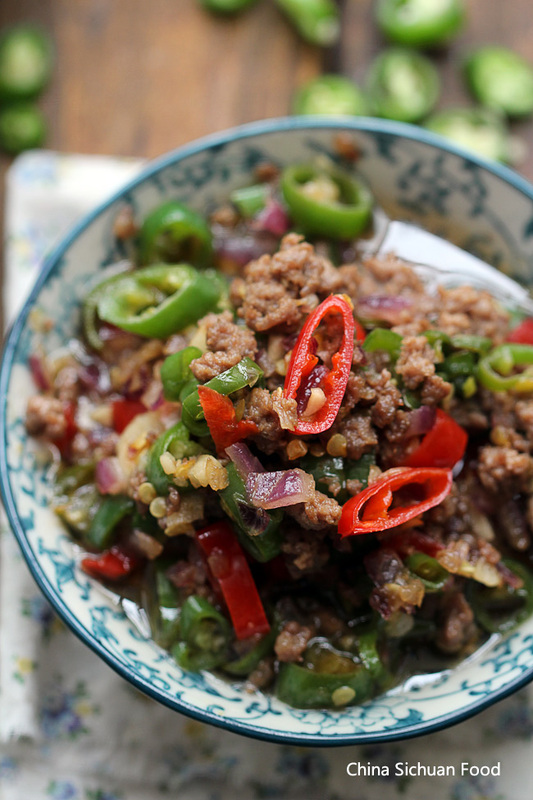 Chinese style Ground beef stir fried in chili peppers, soy sauce, green onion, garlic and vinegar. Now it becomes colder and colder on my side now and it would be so perfect for foodies like spicy food like me. Chili peppers really can warm the body up.In Chinese cuisine, there is one group of quick and easy rice dish named as “盖浇饭”, literally mean dishes over rice. This group is quite popular in the city of Xian, where I spend my four year university life. In both smaller restaurants and large ones, there are various types of rice bowls provided. For example the dish for today is named as ground pork rice bowl. 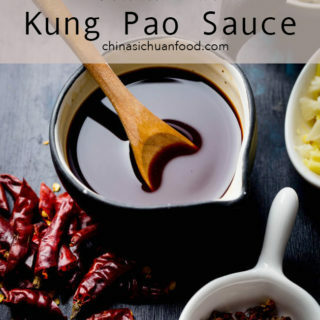 The savory sauce is perfect with steamed rice. In China, beef is quite expensive. So pork is the most common meat ingredients. However all of my family members including my 1 year old daughter, so I made lots of beef dishes. My favorite versions are spicy Sichuan style beef stir fries or stews. Even I am quite diligent in kitchen, but there are changes that I do not to cut beef or other meat. Then I just feel how wonderful the ground pork or ground beef is. Besides rice, it is perfect for noodles too. 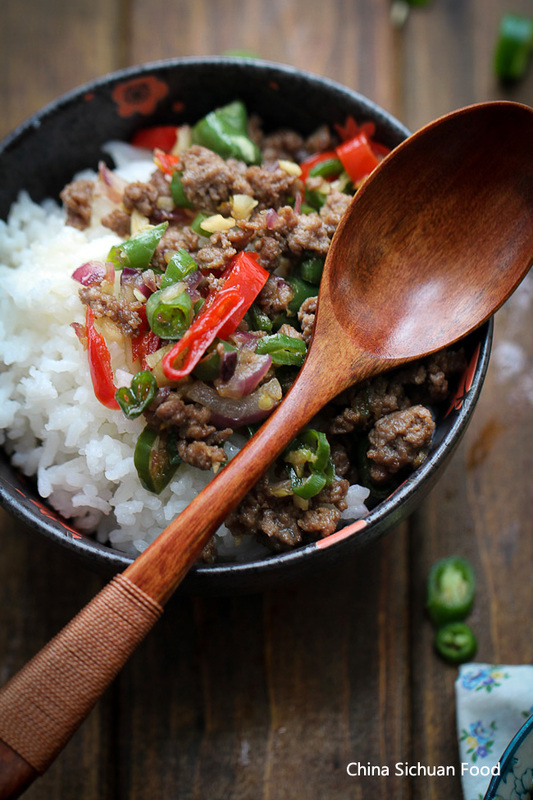 Spicy Chinese style ground beef rice bowl. 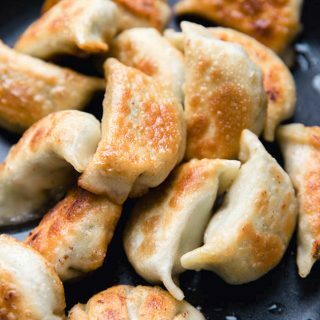 Heat up around 2 tablespoons of cooking oil in a deep pan or wok; add ground pork to fry until the peek color disappears. And break them into smaller particles during the process. Transfer out and leave the oil. Add garlic, red onion to fry until aroma. And add red peppers and green peppers to fry for around 1 or 2 minutes. Longer cooking time can reduce the spiciness of the final dish. 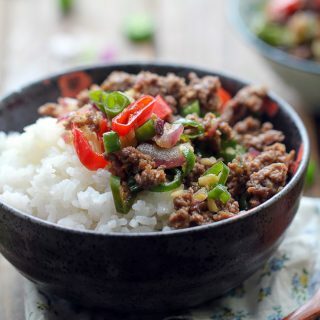 To serve, pour the ground chili beef on your freshly steamed rice. And serve hot! For a milder version, reduce the chili peppers. Sign me up for this! Such classic flavours, I love it. 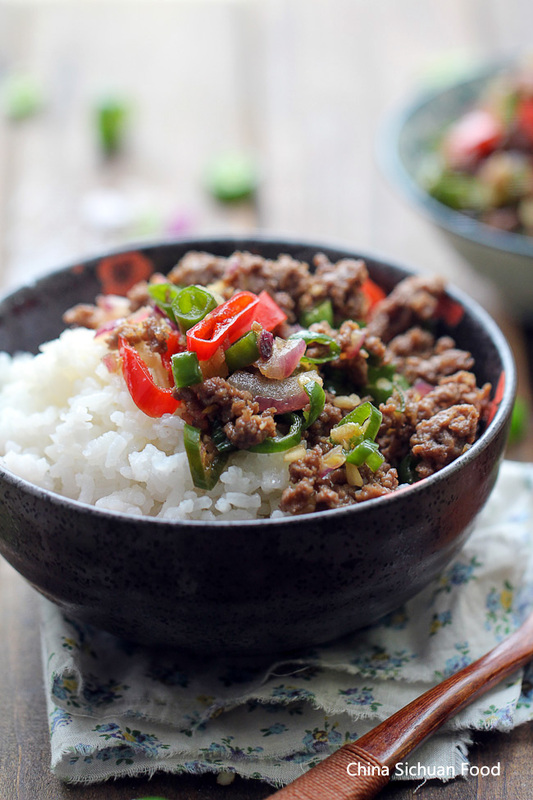 I don’t think many people think of ground beef when they are making Asian recipes. But it is SO good!! 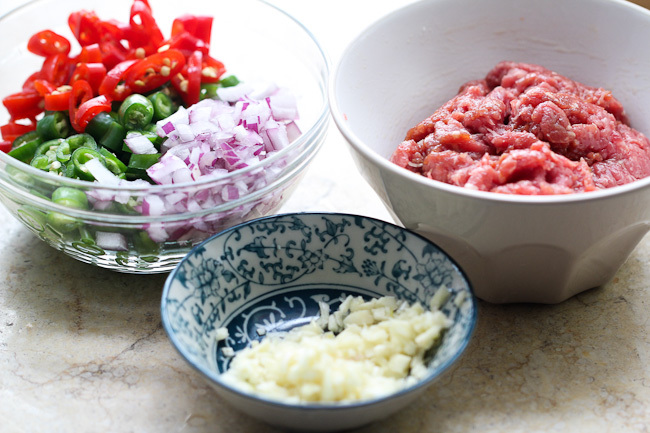 I first discovered using ground chicken when I made Larb (Thai). Then I was obsessed! That’s so right Nagi, ground meat usually is so good with many of the Asian style seasonings. 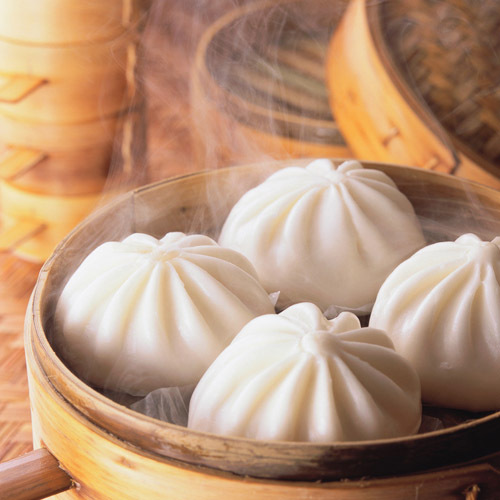 They are even better when served with steamed rice. Thanks for the information. I searched Larb and it looks quite interesting and yummy. Your recipe calls for 1 cup ground beef. Is this a mistake and intended to type 1 pound? If I used 2 pounds of ground beef how much of the ingredients should I use? Should I double both the marinating and side ingredients? No it is just 1 cup ground beef,not 1 pound because it is directly served with steamed rice. If you want to make a larger amount like 2 pounds, then you will need to triple the marinating and side ingredients. Made this recipe. 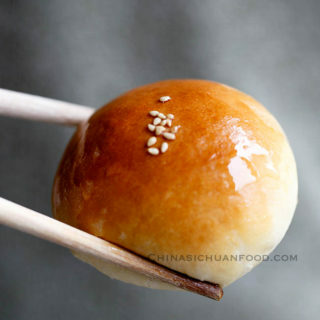 My husband and I loved how simple and fast the recipe was, and how it used ingredients we had on hand while still giving a unique flavor compared to what we usually cook. 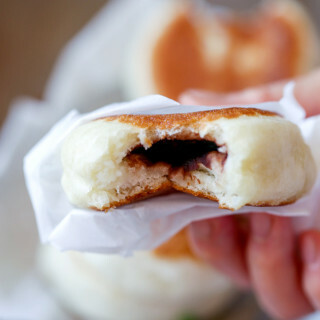 We agree the ginger mixed with the ground beef really made it. Thanks for sharing. Thanks for leaving me this sweet note. I am so glad to hear you love this too. 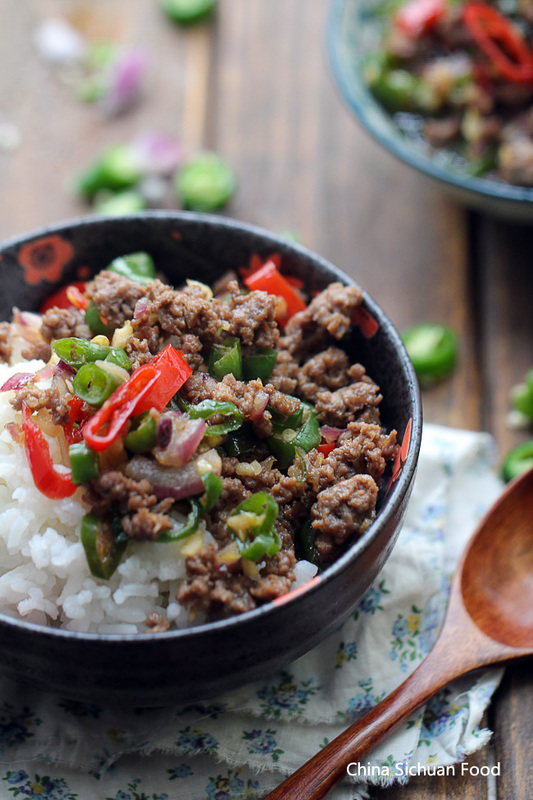 Ground beef stir frying is one of my husband favorite beef dishes. 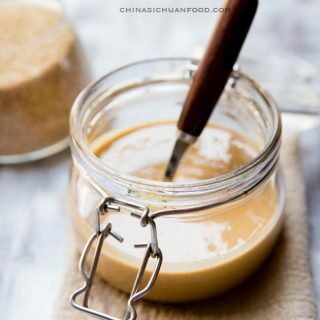 There are indeed lots of wonderful dishes requires common ingredients and just a different way of cooking. Happy cooking ahead. Where I live beef is VERY expensive. Could I substitute ground pork, and if I can; would I need to adjust or change any of the other ingredients. Thanks so much for all your wonderful recipes. Yes, you can definitely use pork to replace beef. No changes for the ingredients. Thanks for the correctness. Yes, I should mean ground pork. Ground pork can be used to replace beef.But beef tastes the best. I really like the sound of this recipe, but would like to know what chili peppers you used. I am using local Chinese long chili peppers. Not sure whether you can find them. 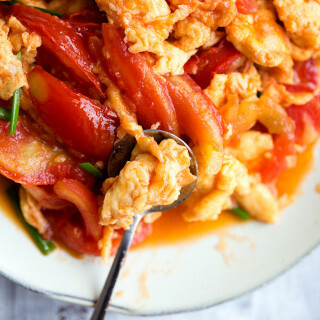 However you can use any peppers with stronger spicy taste instead. It serves three with steamed rice. Holy god! This is the second time I’ve made this and I still find it too spicy. Followed the recipe exactly the first time and used less peppers and cooked them longer the second time and I still have tears and a runny nose while eating. Don’t get me wrong….it’s tasty just a bit too extreme even for my taste and I love spicy food! Proceed at your own risk! Btw, black vinegar was used the second time and balsamic vinegar was used the first time as I didn’t have black vinegar and there is absolutely no difference in flavor. Thanks for trying and let me know the result. 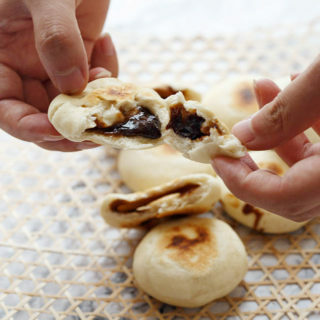 This dish has a origin in Hunan cuisine which is famous for its spiciness. So I can guess it might be over spicy for lots of people. Vinegar used here is just a small amount, with the volatilization process, it can make the beef tastes tender and pure. Happy cooking and go ahead to check other recipes. As you can find that I have lots of spicy recipes on my blog. You are the most welcome, Za. I looooooved this Recipe! I used ground turkey meat. I will definitely make this again soon. I couldn’t get enough of it. Thanks for the feedback! Glad to know you loved it. Happy cooking! Thank you Annie and welcome to board. 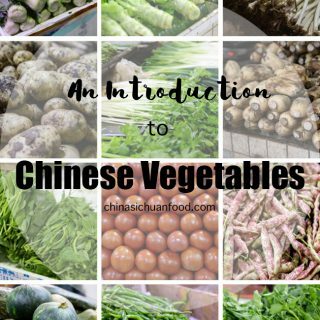 We get lots of wonderful ingredients and seasonings in Chinese Cuisine. Happy cooking.